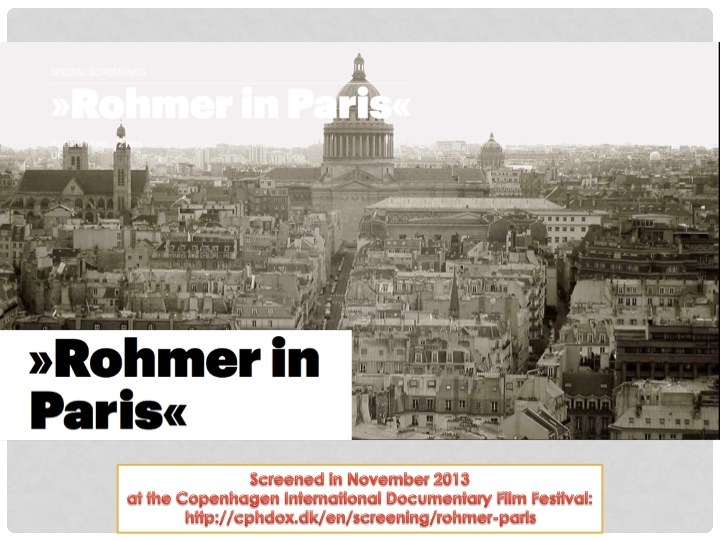 A Presentation Given at the Audiovisual Essay Conference, Frankfurt Filmmuseum/Goethe University, November 23-24, 2013. The essay freely associates what can be found associated in the freely chosen object. It doesn’t insist stubbornly on a realm transcending all mediations. Thank you so much for inviting me here. [Frankfurt] is a really special place to come to in regard to the essay as form [ – Adorno, author of my epigraph, wrote his famous work on the essay form here]. I am sure various speakers will refer to that genealogy. 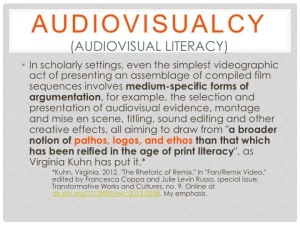 But I’m just delighted to be speaking in a conference on the audiovisual essay. It is, I think, the first time that form has been singled out for discussion in a conference anywhere in the world, to my knowledge, so it’s wonderful to be here. 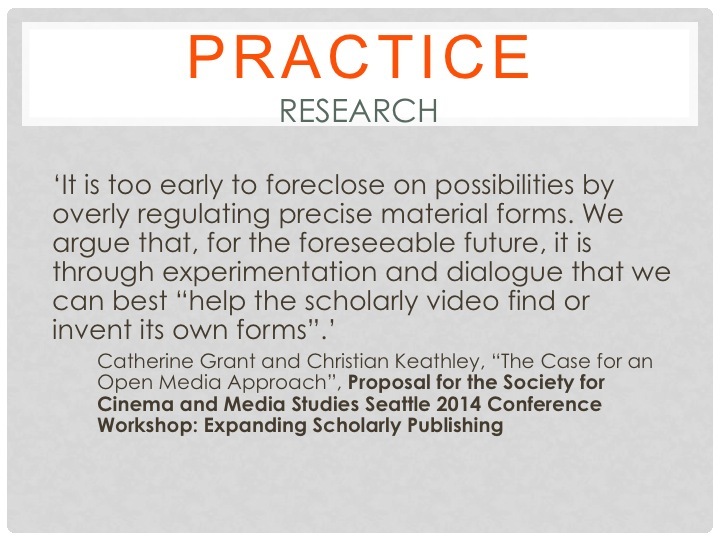 In terms of practice and theory [the conference subtitle] I am definitely going to be speaking about practice, and about the theory that comes out of practice. And that is a real shift around for me because I was, I think, for many years, a theorist. Solely a theorist, working alongside filmmakers, who were practitioners, but always looking on at them and seeing what they did as somehow different from what I do. But in the last, I guess, six years now that’s not been true and I, in lots of different ways, have been involved in what I would call practice around film studies. 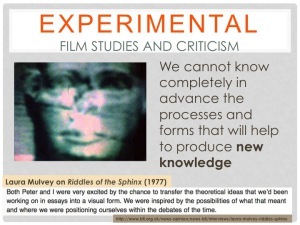 But I am involved in film studies practice, which is […] the focus of my talk. I am going to use the term videographic film studies (and film and moving image studies). 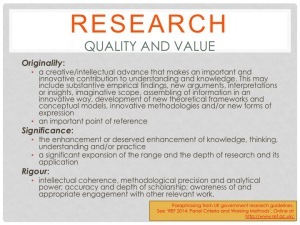 I will refer to the essay as a specific category within that, but I am talking about a slightly broader field. And I think I am really speaking about online work — work that has circulated publicly online — and I [hope] the reasons for those choices will become clear. When Adrian [Martin] and Cristina [Álvarez López, the conference organisers] invited us, I think all of the speakers got the same email, possibly in a different language, but one of the [sentences] in it was this one: “For we have noticed an intriguing resistance to this work, [this was the reason why this conference needed to happen now]: within various pockets of the academic world either the shrug off ‘It’s nothing new’ or the more aggressive ‘these are just tools for analysis, not analysis itself’.” And I think this is the thing that really struck me as really interesting to look at right now. 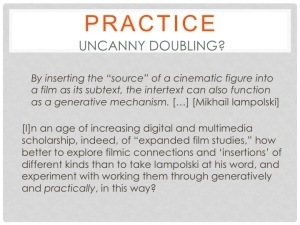 It’s going to come up in a number of ways in the presentation, but it’s certainly the case that in the world at the moment there are probably only, I’d say, fewer than thirty people [publicly] making videos in a [film studies] academic context. Even though it’s easy to do so now. So I am interested in [this resistance] as a phenomenon: […] why are people still preferring to publish and carry out their research in pretty conventional and traditional written formats? Even though, of course, we are here to discuss why this is changing and how it might change more. Where all of our work is situated is, I think, an interesting question. I am trying to explore different parts of the spectrum myself, not in a particularly systematic way. But it just occurs to me, for different projects, that different places on that spectrum are important. 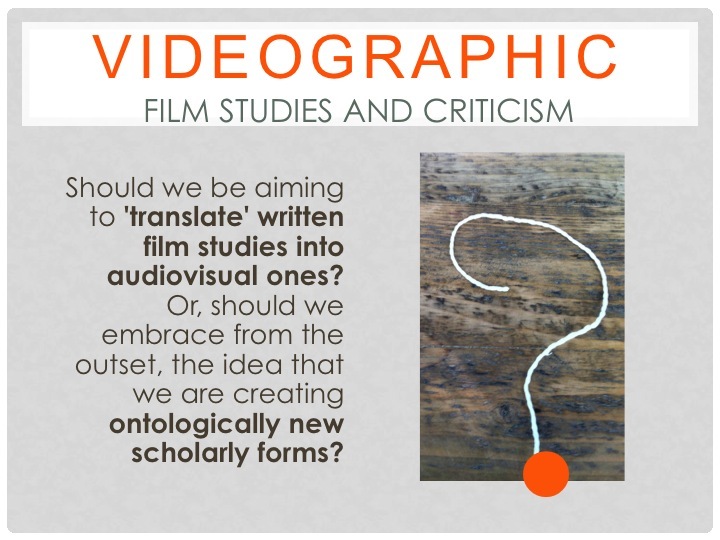 But one of the questions that really strikes me at the moment, working as an academic who is having to justify what I do all the time (this is the context of contemporary humanities academia), is this one: should we be aiming to translate written film studies into audiovisual ones? What is the relationship between this body of work of written film studies and this emerging body of work of audiovisual film studies? 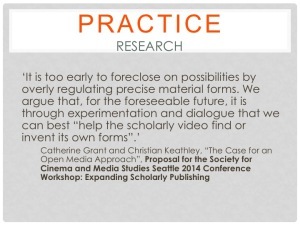 Or […], should we embrace from the onset that we are creating new scholarly forms that may or may not have particular reference to earlier forms? Should we be less anxious about this process? And I am very clearly arguing that yes, we should be less anxious about it. Partly because these new forms are not replacing the old forms. I don’t think they will ever replace the old forms, they are not really about replacing the old forms. They are living alongside the old forms and some of us are doing both, and I have to do both in my job, although as Adrian [Martin said in his introduction to my presentation, it seems] I certainly find it easier to [work with] the new forms. [The] essential question I am posing in my talk, though, is the one in my title, how long is a piece of string? – which Wiktionary very usefully defines as “(often humorous) used as a response to a question such as ‘How long will it take?’ or ‘How big is it?’ when the length or size is unknown, infinite, or variable.” And that is the position I feel we are in, in this field: unknown, infinite and variable in different ways. We are clearly at a stage of primary exploration of potential formats, [in terms of] the scope of these studies, these essays, and also – it is not a word we often use in discussing academic work, since it has got such nasty economic associations – but what is the value of this work? 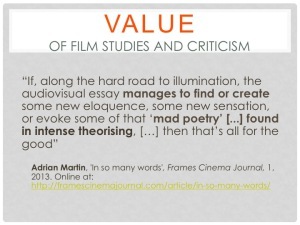 And lots of writers have already been writing about that, I think Christian Keathley, Adrian and Cristina have [all] contributed essays to a collection I [commissioned and guest-edited] of around forty pieces of work on digital film studies,4 on digital forms of film studies; but around twenty of them dealt specifically with the video essay. 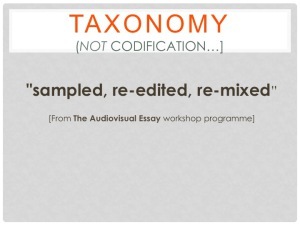 So lots of people are weighing up the value of this work at the moment, […] the value as alternatives but also as additions to hegemonic and conventional text-based academic research and publication processes and forms. Now in my [university] context, working in the UK where we are, you know, subject to [audits on on our published work], humanities research [often] still simply means weighty monographs and journal articles. And, in a way, I am “getting away with” my work because I am putting my videos into the [academic] context of written articles [published in online journals]. [Then] my colleagues – wonderful as they are – can, if they like, ignore the videos, and look at the written work which is about the videos, and in a way that [might make] more sense to them. So there is a real problem [about] how academics spend their time. Can we justify making these things? Are they just seen as playful extras to our serious academic work? And although this isn’t stopping me, it is a serious concern about being able to do this as a paid academic, and I suppose [also about the] academic and intellectual freedom that we are otherwise generally encouraged to exercise. So I am saying that, at the moment, especially in the UK and America where a lot of the video essays are being produced – especially in America – that there are pressures to codify [this work in order to support its role in academic career structures]. And in a way we might say that holding an event like this forges a space for that kind of codification, if we want it to. I would really warn against that, though, and say there are dangers to prematurely doing this. It will probably happen. 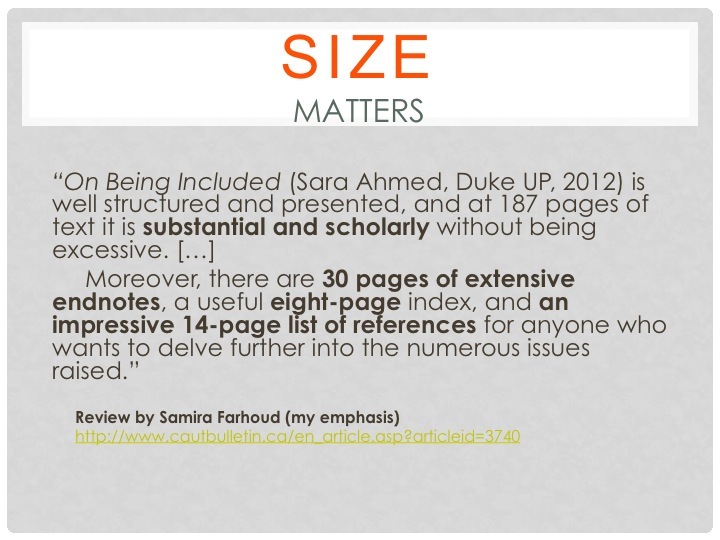 I happen to know that various journals are being set up [to publish] audiovisual work and the discussions taking place to establish those journals is absolutely about what length should [videos] be, how “big” should they be, should they have footnotes, should they have annotations, should people always write a commentary about their work to accompany it? So there is a lot of that kind of discussion going on. 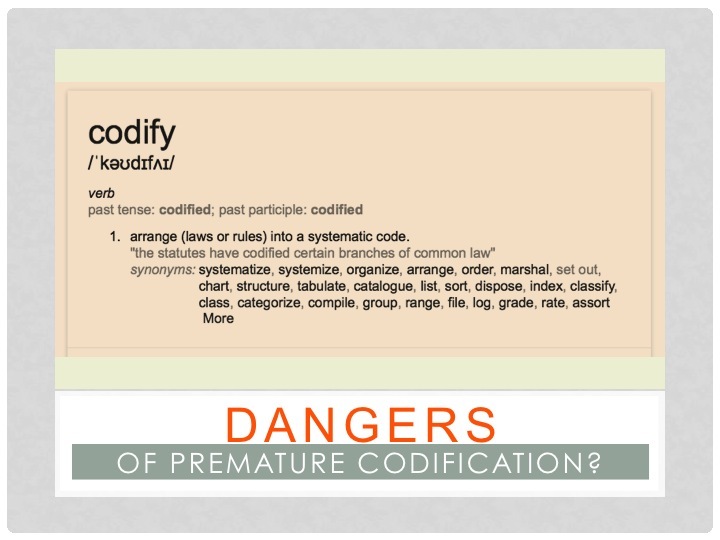 But I am absolutely warning against us trying to copy the signifiers of weightiness in writing in the audiovisual version of our work. 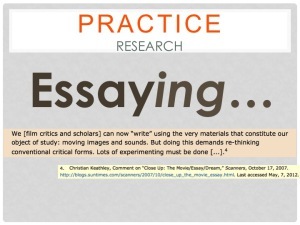 And in a way that is why I am a little bit more sceptical than many about the term “essay”. I will come back to that but I think “essay” has a certain code imbedded in it. One of the things I am going to clearly argue to my colleagues and others at the moment is that this work doesn’t have to have any difficulties in assimilating it into an academic context. 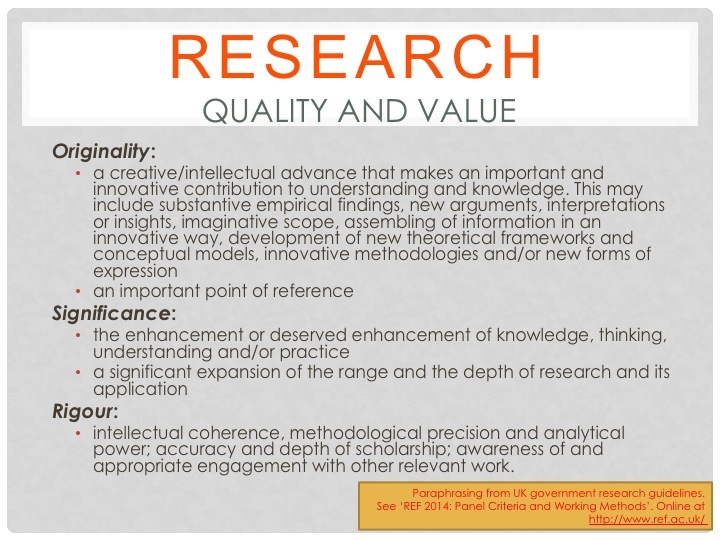 [The qualities listed in the adjacent slide here] are actually UK government criteria about what our research is supposed to do, and our work is judged against these in our system of awarding our work one to four stars according to how well it achieves these criteria. I think these are very interesting definitions […] but […] we are not expected to do [achieve each] of them equally. And so when you start looking at them in relation to written work or audiovisual work, you see it makes no difference: these are supposed to apply to science as well. So, you know what? There really is no problem, unless we want to there to be one, and of course that’s the problem: some people do want to have a problem with the audiovisual essay. 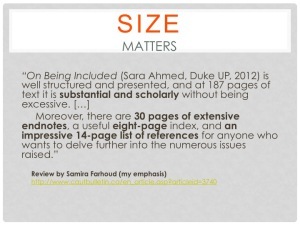 [As an aside, recently,] I happened to see a reference to a [very favourable Humanities] book review […]. But even this [great] review of the book, which is on one of the most untraditional subjects in contemporary psychosocial/gender studies, is obsessed with length […] an obsession [which is] particularly anxious in the context of non-traditional work. OK, so they both talk about length and Erlend Lavik’s take [in the second video is that] he’s definitely drawn to the longer form. [Richard Misek is also] drawn to the longer form, as we’ll see. But I’m [equally] interested in hearing how Richard talks [in the video above] about new knowledge. Because ultimately that’s what we are wanting to do when we research things, is to find new things out, to produce new knowledge about something. 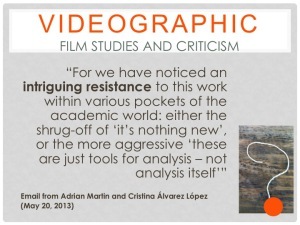 And I think that that’s certainly what audiovisual essays have the potential to do. But I also believe this kind of new knowledge may [sometimes] be different and I [hope to] come back to that. So, two and a half years ago it may have looked like length was going to be a desired academic objective or focus [for audiovisual essays] but, possibly for the reasons that Richard mentions [in his interview], that’s not quite how it’s working out. Erlend went on a year later (in this issue of Frames that I edited) to discuss some of these issues in detail and he really makes a very strong case for longer work to be produced in the resulting article.7 And he refers to the tradition of the essay, the Adorno essay I was talking about […], but also Philip Lopate. So these guys are academics, and they are presenting their work as academics, and they are discussing it as academics – they’re also writing about it separately as academics. 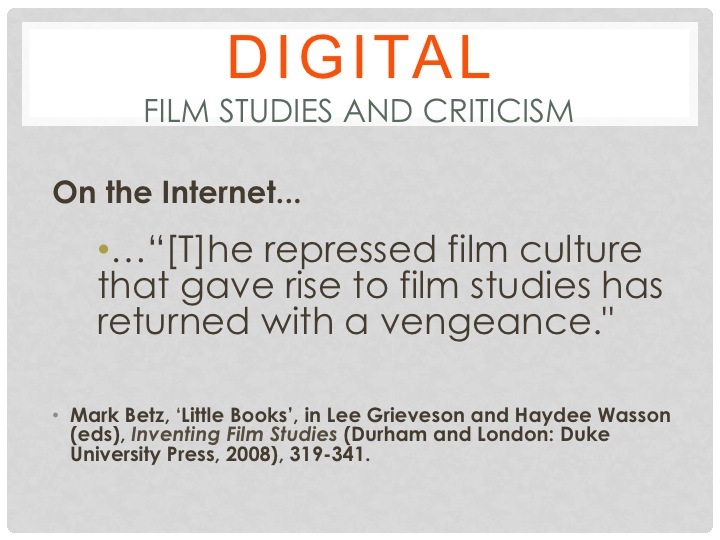 But they are also part of the phenomenon about which Mark Betz in, I think, one of the best essays about film studies old and new,11 has written this killer sentence — on how the internet has changed cinephilia in general, and [how] the repressed film culture [that gave rise to film studies has] come back, or burst back online. All of [the things] that we no can longer do straightforwardly as academics, we can do online – or, we can certainly enjoy online – and there is a greater continuity between academic work and cinephile culture, and film culture more broadly, online. [This] unleashed spirit is very much connected to the audiovisual forms which populate the internet. And this should remind us, and in fact does it remind me, of an earlier stage of our discipline when that’s exactly the spirit in which our work was produced. You know, the late 60s and the 70s when there was a period of experimental, and often political, cinema; we have a period of experimental, and [occasionally] political, film studies again. 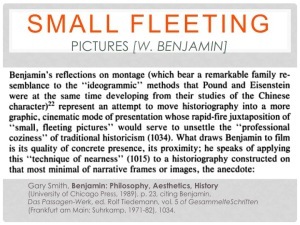 [We shouldn’t forget that] some of the most well-known theorists in our discipline were also filmmakers. And they weren’t all filmmakers in the [sense] that they had been trained as filmmakers; they were [often] avant-garde, artisanal, DIY, get up and do it, get money or don’t get money, get equipment, or don’t get equipment, work with people who can do it or don’t: making all of those kinds of decisions about creating things and working through practice to produce new knowledge. And, as I say, we cannot know completely in advance the processes and forms that will help produce new knowledge. We need to have a notion that what we do is not just research but it’s experimental. The DVD of Riddles of the Sphinx has just been released by the BFI, which is wonderful – it has great things on it as well, and lots of interviews have appeared around it. But what Laura [Mulvey] says in this interview12 is wonderful: “Both Peter [Wollen] and I were very excited by the chance to transfer the theoretical ideas that we’d been working on in essays into a visual form. We were inspired by the possibilities of what that meant and where we were positioning ourselves within the debates of the time.” And yet I am quite interested in how their theory comes first and practice comes afterwards. And that’s kind of an issue for us, in what order do we do things? Now, I may not always want to call my work “essays” but I do see what I do as essaying. In other words trying out things, you know, trying [them] out within a particular space, “writing using the very materials that constitute our object of study but re-thinking conventional critical forms”, as Christian Keathley put it in his earlier essay on this from 2011 in Andrew Klevan and Alex Clayton’s book The Language and Style of Film Criticism, and in another comment: “lots of experimenting must be done.” So while, yes, I do find it easier to make [shorter] videos, I am actually making lots of little videos because I think lots of experimenting must be done. So this is a sort of conscious thrust in my work. But it connects, for me – because of my online context – with something Timothy Corrigan said in his now classic book on the essay film from 2011 […]: “The essayistic describes the many-layered activities of a personal point of view as a public experience.”14 And for me that dialogue is coming from doing this in public and sharing it online and, very fortunately, also at events like this today. So I’m kind of experimenting, I think pretty consciously now, with the idea of rhetoric. I don’t impose these ideas on things in advance but I am aware that what I am doing is developing some kind of rhetoric. 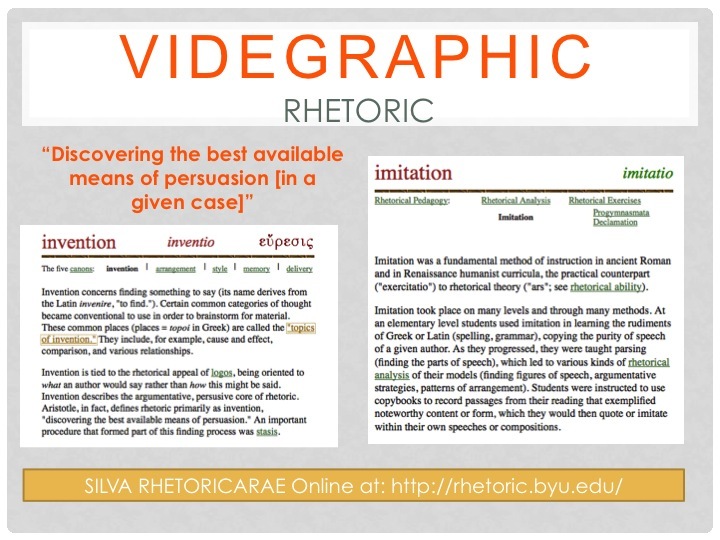 I’m working with invention (inventio) and imitation (imitatio) from classic rhetorical tradition [for instance]. I am copying things, I’m copying essay films, I’m copying other forms of documentaries, and so on, and seeing what they feel like. I’m also copying [or remixing] written work, which I’ll come back to. 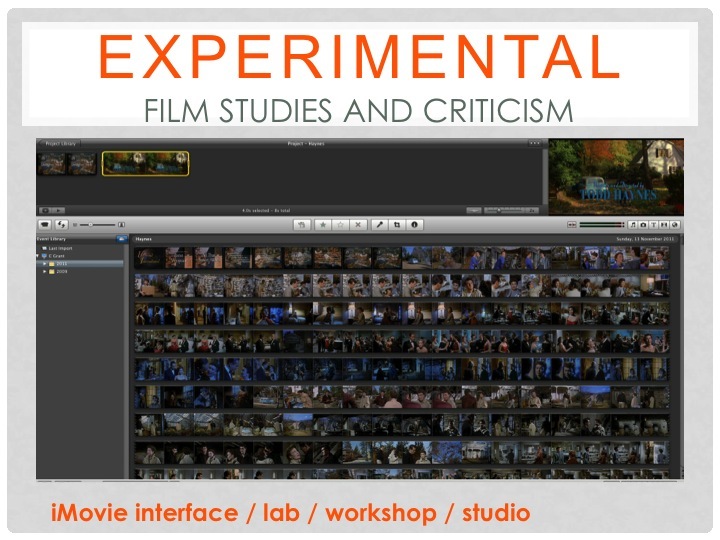 I have a lab for this experimentation, or a workshop. A kind of studio, a digital-virtual studio. I use iMovie, because it’s easy. I also use some other programs, that are much more difficult, for some specific things. But generally I keep going back to iMovie because for me it feels like a word processor, something I know really well, that I don’t really have to think about too much [or in which the interface gets in the way]. I can just do stuff and what I can’t do I kind of learn how to overcome. So you know, I couldn’t do split screens in iMovie for a long time and then I worked out how you could do these with iMovie. […] So that’s the process, a kind of trial and error, and not worrying if I get things wrong or right. And I’m also aware that when the work is shared online there is [potentially] a similar sort of virtual lab-studio-workshop-conference space-debate and discussion. And this is so for a video like Touching the Film Object, which I’m not going to show today but is one of the works I’m proudest of, and one, I think, that’s saying something, and producing some new knowledge even though it’s a collage of existing things. I am aware that what we are doing with this kind of work is providing an active viewing space within the duration of the video for live co-research: a framed experience for participant observation, which particularly through its online distribution dialogically invites responses, if you’re lucky. 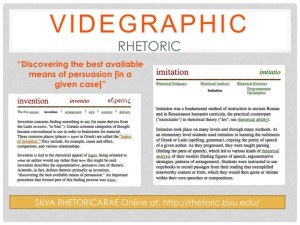 Now in scholarly settings, even the simplest videographic act of presenting a clip, or an assemblage of compiled film sequences, involves medium-specific forms of argumentation, that’s one of the things that I’m finding. You know, literally when you [select or create] a clip and you put it up for viewing, you’re saying something. It may not be like a conventionally worked out academic argument — it may be easier to see [forms of argumentation in] more complex pieces. […] But the selection and presentation of audiovisual evidence, montage and mise-en-scene, titling, sound editing and other creative effects, in other words, all the things you might do to present [or remix] that clip, all aim in this field to draw, as Virginia Kuhn has put it, “from a broader notion of pathos, logos, and ethos than that which has been reified in the age of print literacy.”15 So we are not only producing new knowledge but we are expanding what that might be. And I think it does involve affect, feeling, emotion. I am going to present one of my videos now […]. It’s one I published two years ago, called Skipping Rope, which a few of you may have seen, but I’m going to show it in a version I made for a conference with, as you will see, a sort of preamble. So there are two preambles to this video, two prefaces. Please be indulgent with me. It’s quite long: six minutes. [Skipping Rope] was going to be an explanatory essay when I started out. The urge was “let’s do this thing we couldn’t do before” […], this thing that [film theorist D.A. Miller, whose work I discuss in the video was, seemingly, also interested in] doing. In his 1991 article,16 he talks about a bootleg videotape which actually allowed him to see the edits he hadn’t been able to see in a film screening of Hitchock’s Rope so easily, or at least he hadn’t been able to capture them all, be certain he had them all. So [that bootleg video was] his fetish object, and for me there was obviously a fetishistic edge to this particular videographic work […]. I couldn’t make it without remembering how I felt reading D.A. Miller’s essay, which, if you’ve ever read it [you’ll know], is very difficult to understand. It’s a kind of high point of queer theory and, you know, you really have to struggle with this piece, so that [struggle] was in there somehow, too. And then you have to make aesthetic decisions: how do you show the edits? Somebody else has actually made a [skilful and properly explanatory] video [with this function] very recently in which the editing choices are more conventional, quite fast and snappy looking. But I never wanted to do it like that. I [also felt compelled to connect up my video] with music. Music makes a big appearance in [much] of the work that I do. Here, I chose to use Poulenc’s music that Hitchcock uses in the film, without knowing why I was doing that, really. And so all these elements produce an experience which is quite far from the straightforward explanatory collection of the edits that I had set out to make. And it’s as if you kind of can’t help but do it the way you do it. 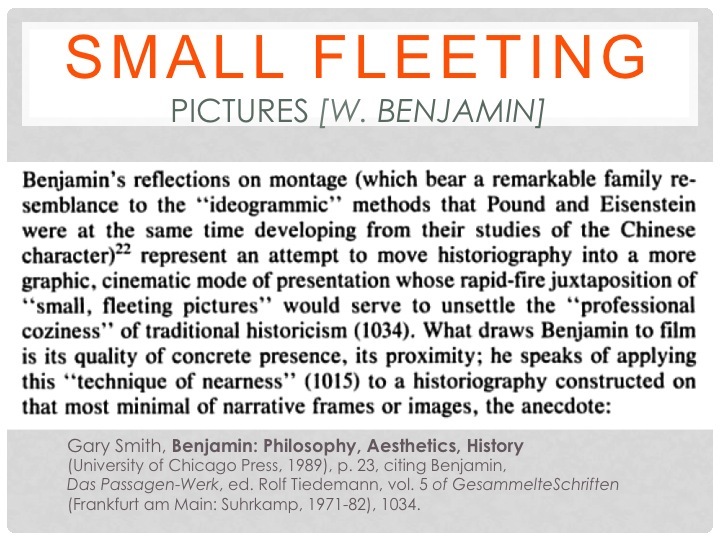 And of course this other aspect is [connected to] the play that goes on throughout this video work, [play] with writing and the idea of movement and stasis, writing and the audiovisual – again, something that I really didn’t know that I was doing when I’d started [research for this work]. 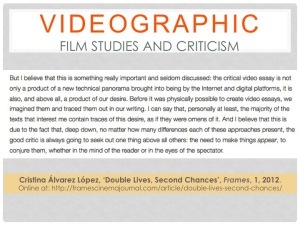 But one reflection [on the video essay format] that says some of this better than anything else is Cristina Álvarez López’ essay “Double Lives, Second Chances”,17 first published in Transit. Cine y otros desvíos and then translated for the issue of Frames where she talks about, in a way, what D.A. Miller was going through when he wrote his essay [on Rope]. […] Miller clearly had a desire to create an object that showed the edits, that showed the kind of intense “homosexual moments” around the edits in the film, but he couldn’t [have done that easily then]. So the desire to make these objects precedes them: it was explored in writing first and is still explored in writing. 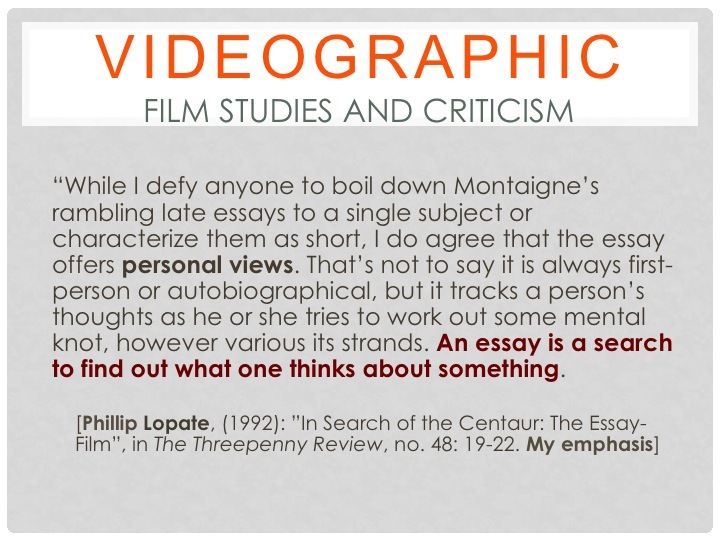 People don’t have to make video essays to make video essays — they can make them in their writing, too [and in their heads, in a virtual form of découpage], which I think really was made apparent to me in [Cristina’s] work. 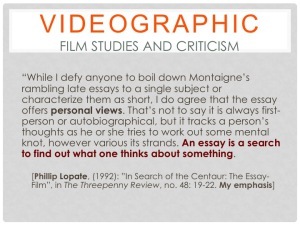 For me, an essay – and that essay in particular – is definitely a search to find out what one thinks about something. So I wanted to collect these edits but I wanted to find out what I thought about them in the light of having been exposed to D.A. Miller’s earlier work [on Rope]. 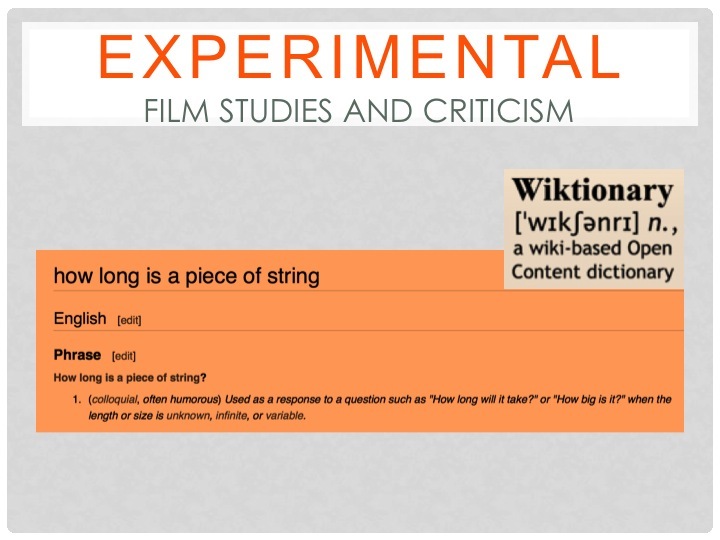 But you could also see that, for me, video essays are not always purely audiovisual, [made without the use of] text. They are quite often, for me, these kinds of quite rich text objects. They use text [and typography] in all sorts of ways. I recently made an assemblage [for my research] of the word “this” in Michael Snow’s work So Is This, which is originally a film completely obsessed with text, and I am obsessed with the text in it. So there is something about text that I am definitely drawn to in exploring these forms. Jonathan Rosenbaum wrote about this […] for Moving Image Source18 in a brilliant essay called “The Mosaic Approach” where he is talking about digital video culture generally and especially the [critical] work that is on DVDs, and in forms of DVD commentaries in particular. He writes, “The fact that these commentaries belong to a hybrid form [at least, commentaries that he particularly likes, which involve text] — existing somewhere between reading and watching, like various computer-related activities— is part of what seems forward-looking about them. Developments in fragmented, mosaic forms of print criticism can be spotted elsewhere […] What all these forms of criticism suggest is not merely a less linear way of approaching film experience but also a more interactive methodology.” And he really nails it for me because these videos — [while] it is great showing them here [in the cinema of the Filmmuseum in Frankfurt] — are not made for this kind of [large-scale] projection experience. [Mine] are made to be seen on little screens where there are other things going on around them, including text: our activity of watching them can often be very similar to other activities of “reading-viewing”. These activities are becoming convergent, as media generally is [obviously]. […] Context is forging these forms. Like other video essay practitioners, I have begun to look — I mean not to codify too early, obviously, but just to kind of look — at what I’m doing, looking back at what I’ve done with my body of work now [up to 90 videos produced by September 2014], and at what other people have done. 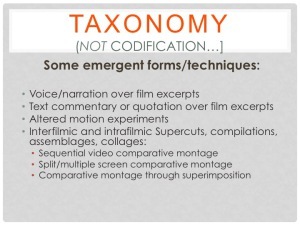 I’m just beginning to see common themes and strands [in this emergent work], so I would say generally that this is the common theme and strand of videographic film studies, the work that is sampled, re-edited and re-mixed. But if one might say that there are some [specific] emergent forms and techniques: voice narration over film excerpts is clearly one of them. 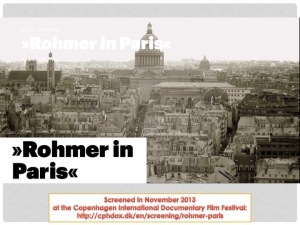 In a way it’s still the most common [element]: Richard Misek’s Rohmer in Paris has a voiceover, most of the videos that Kevin Lee has made have, Matt Zoller Seitz – [they all tend towards using] voiceover. I used voice over in my very first essay, as well as in a couple I haven’t yet published, but basically I don’t [tend to] use voiceover – you could ask me why, if you like. I don’t like it, basically.19 But what I do quite like as an alternative is to use text commentary or quotation over film excerpts. Another common practice, as you saw [also] with Skipping Rope, is altered motion experiments, whether something is slowed down or sped up. You also have film comparisons going on, whether they are comparisons of a particular thing within a film – intrafilmic comparisons, or between films – interfilmic comparisons. 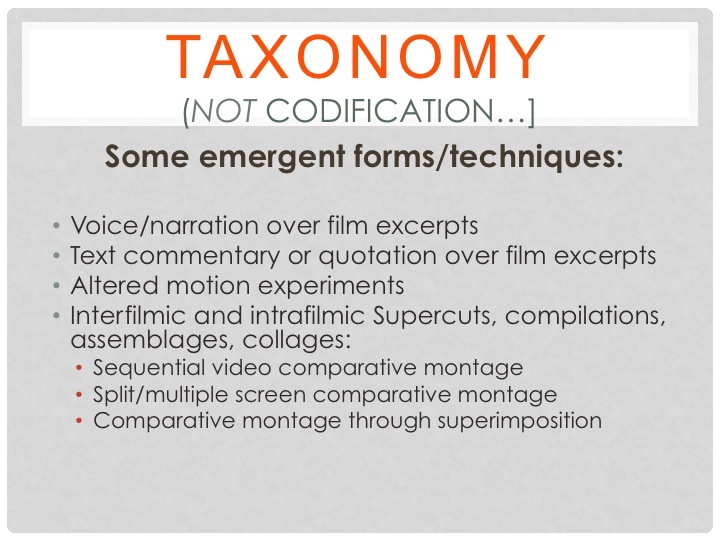 So you have the phenomenon of the super cut, which is an internet phenomenon but scholars are increasingly using that idea, and obviously Skipping Rope is a [kind of] super cut of all the edits in Rope.20 But compilation films, assemblages, collages in general, and within that category of comparative film videos you have sequential comparative montages. I think tomorrow, one of those that I made is going to be shown [in the screening programme at the Audiovisual Essay workshop], True Likeness, which is one clip after another, comparing moments from Peeping Tom and Code Unknown. But also, and this is where I think Cristina’s work has been so inspirational, split screen and multiple screen comparative montages [abound now], some of which I’ve also messed around with. But recently I’m making a lot more work [based on] comparative montage through superimposition, so I’m going to show that as well [shortly]. 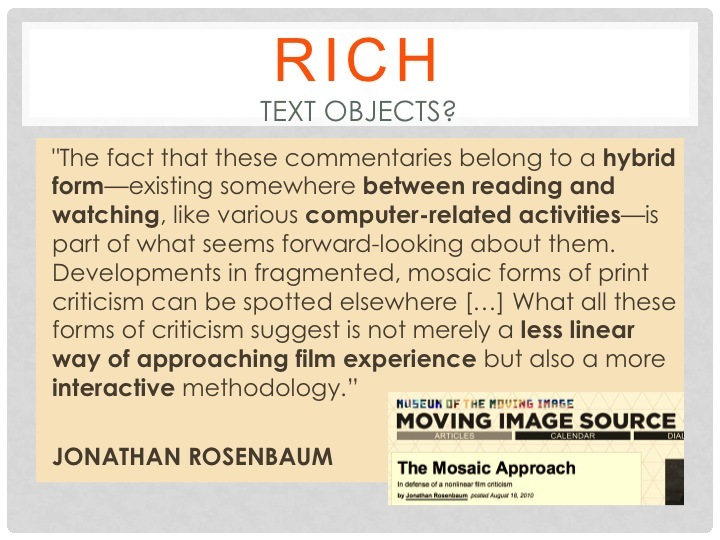 So all of these different ways that one can compare different film texts seem to be really significant [in the audiovisual essay form]. I’ve written quite a lot about this, including this particular article, which looked at why I moved from doing sequential ones to doing split screen and multiple screen comparisons, but basically I’m going to turn this last part of my talk to, in a way, the research that I’m doing through this, not just the forms but the research. Here’s another one [of these experiments]. This is slightly longer. This is a remade version of an earlier video. The original one was called All That Pastiche Allows. I made [the new one] a couple of weekends ago for an academic celebration of film scholar Pam Cook’s career — her work makes an appearance in this video. 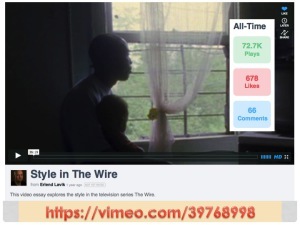 At this event, I had the pleasure of showing the video to an audience that included Richard Dyer and Pam Cook, and this experience intensified the feeling that had gone into making it, which was very much in the first version of the video, because it was a [deeply felt] tribute to Richard Dyer’s work. And then watching the earlier video through again, some time after making it, I realised that actually it was demonstrating something else that I hadn’t read when I made it, which was what Pam Cook had written about pastiche in one of these films. In a way, both [versions of these videos began anew] with this idea of the feeling of pastiche: in Richard Dyer’s book he very much argues that pastiche is not an empty form, it’s a full form, a form full of feeling, and so the video, I think, certainly demonstrates that, as well as the notion of knowing while you feel and feeling at the same time as you know new things. 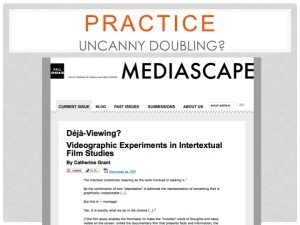 It was the affectively loaded experience, in my own remaking, of re-looking [so closely] at what the camera’s doing, and watching it repeatedly in my video editing programme [in two different sustained periods of study] at the way that it was set up [with the split screens], showed me that there was a inverse mirroring going on. [But being immersed in it over and over again precisely with the music playing, further intensified the whole experience] and I suddenly started to see something completely new [in this case] about remaking in general and about adaptation as a process [that I hadn’t really seen before:] that is, that at times it’s about multiplication, it’s about intensification, it’s about, to use a word I’ve used in a recent video essay I’ve made with Andrew Klevan, magnification. And that really was something I hadn’t thought about like that before […]. So here’s another video I made for the Pam Cook event, and again it does something new, because I’d reached a point at which I felt the forms that I had been using – split screen and sequential montage – really weren’t enough to do this comparative work anymore. This whole vein in my work has definitely come from a desire to make films speak together, which I’ll come on to a little bit in just a second. But I want to show that Pam Cook this week posted this video. Pam had never made a video essay before and it was at that conference, that celebration of her work, where she saw that and loved it, decided she needed to “write” about her own work in this form and here she did. The [really brief videos] videos that I’ve just shown come out of an experiment with superimposition through the use of dissolves [ – simultaneous comparison can, of course, be performed very quickly!]. In the last minutes of my talk, I’m going to return to the question of length, with which I began. When you are making these videos [for online circulation], you know from very early on that the shorter they are, the more people watch them. Cristina and I were kind of swapping notes on this last night, and about three minutes is the optimum length. So I wanted to see how, if you make them shorter, would more people watch them? And so I wondered, “what can I do in thirty seconds?” I had long thought about the connection between these moments in Blackmail and Carnival of Souls. And I’m writing about Carnival of Souls quite a lot at the moment and I have taught Blackmail many times, and I mean, you know, it’s a film made on the cusp of [the technological and industrial transition between silence and sound in cinema], so questions pertaining to the soundtrack are particularly important. And I was interested in how bird song is often used in films for these moments of interiority. In the Blackmail sequence, bird song takes the character into herself; in Carnival of Souls it takes her out of an absorption [or entrapment] in herself in a particular moment. So I thought it was a perfect thing to explore at that length […]. So I kind of thought, what can I do with this. And you have to start with an idea, even if then things completely take you away from that initial idea.26 But there’s a moment in that very first video essay that I made that completely obsessed me. And this was a traditional sort of voiceover video essay that I’m still pretty happy with although technically it’s terrible, the sound quality is particularly bad. But I’m just going to show you the moment in the original video essay, which was a study of Chabrol’s Les Bonnes Femmes. When I made this video I had an idea about what I wanted to do but actually it was great because I really allowed the film and my love of the film dictate what I actually looked at. And it was [one of the] the longest ones I’ve published, I think thirteen minutes or so. Seems so long now. But, of all of the things in [it], that particular sequence was the one I loved in the film but also in my voiceover, because I happened, even on the first take to put that line, “And then it does”, at exactly the right moment, when she looks at us. So the feeling I engender in the video is the feeling I had watching it, which is this charge – a kind of libidinal charge, if I’m honest – of the character connecting with you in the way, first of all, you are not expecting, but it is [a look] full of a communicative potential, I think. And so I thought, “Oh, Vine, I can do something with that. It’s a short moment, let’s see what I can do with it.” So you know, this kind of re-making, re-forming, re-visualising, re-audiovisualising something has led to this [next video]. I’m going to do more of these [Vines on direct address] because I’ve actually made a much longer video with Tom Brown on direct address [more generally] in the cinema, so I’m clearly going to go back to some of the things we’ve been talking about there and see if Vine will help illuminate them, and I’m not sure that it does! But when I made it I decided to re-edit it, unusually for Vine because people usually just film [things and instantly upload them online]; I actually edited my video and added music that doesn’t come from Les Bonnes Femmes; it comes from Debussy, and this I really love. It’s just the opening notes of “The Chosen Maiden”, because that seemed to me to be what this moment was about: this woman is being picked up in a night club, she is chosen, but I’m also chosen when the character looks at me, so that’s the feeling that I wanted explore. I will just let it loop for a few seconds. Now of course it doesn’t do it, it doesn’t really give you the charge. But the charge of actually filming it gave me the charge, [the charge of capturing it]. Because you can’t really do very much in six seconds with a mobile phone filming a screen playing a film, but there is something about re-filming that I am now beginning to explore. And re-filming takes me back to Riddles of the Sphinx, because when I did a little video for Film Studies for Free with Laura Mulvey using the DVD audio commentary over Riddles of the Sphinx and she allowed me and the BFI allowed me to pick any moment I liked from that commentary and make it a little video, the moment I picked was when she was describing the re-filming technique that they used for the sphinx footage in that film. And so there is something about re-filming that I think has potential for this form as well. So we are not just editing found footage that exists in a digital form already, but we are actually then re-creating our own journeys around that footage. But finally to return to the question of length: this is really how I’m conceiving of my work at the moment, even if it’s longer than seven seconds or six seconds, and maybe even five minutes or ten minutes long: I’m still seeing my work now as short or small video or ideographic sketches. Oh, sorry, studies; sometimes made of sketches. So the idea of the study as a sketch towards something perhaps, for an on-going collection of work. These individual pieces may sometimes form the basis for larger or longer pieces of audiovisual work, or written work, or multimedia practice more generally. I’m returning to Jonathan Rosenbaum’s conception of the internet as this sort of mosaic form. You know, it’s particularly interesting because [so often] you see your [online video] work represented back to you as little thumbnail images of the chosen [display] picture, which is sort of like the front page of your video. And these [tile forms] are forever shifting, they are forming a kind of virtual mosaic, and they are shared around very much [in these ways ideogrammatically] in the online context. They are also broken up and re-formed. And the more people do this the more that dialogue [about them will be generated]. I just wanted to finish [by, in a way, asking] what is this all about in terms of new knowledge. What is this all about in terms of studies. I have spent my whole [career to date], I guess, focusing in a very [conventional] academic way on my writing, and [it’s clear to me now that audiovisual work] frees me up in some ways […], but I do believe this is also doing something theoretically [for me] as well. But if it’s doing anything theoretically, especially at this more poetic end where my video work seems to be gravitating to at the moment [as the above mild ravings testify], it’s around [Adrian Martin’s idea] of “mad poetry”,27 a kind of intense theorising, something that’s coming from somewhere that feels less consciously controlled than [conventional understandings of] academic rigour that we’ve had in the past [might lead us to believe]. And I think that this [might be] the threat of this work. So you know, in a way, one way of defending [these emerging practices is to] defend the [full] spectrum of the work, which is what I do. So, at the [explanatory] end, I’m very happy to have the scientific studies, they are just not the ones I choose to make, but I want that spectrum to exist as long as people [whose work is] at that end of the spectrum are happy for the other end of the spectrum to exist. It’s when mad theorising is argued against [a foreclosing of it before we know what it might produce in terms of new knowledge] that I become very defensive. So, for me, in terms of the [so-called] “crisis of the humanities” at the moment, it’s important to defend the range of work that we do. And this is a really new and exciting part of it. Thank you for letting me speak about it. 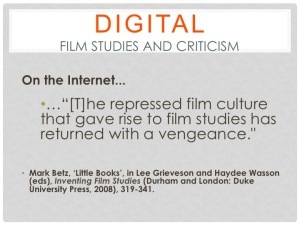 Catherine Grant is Senior Lecturer in Film Studies at the University of Sussex. 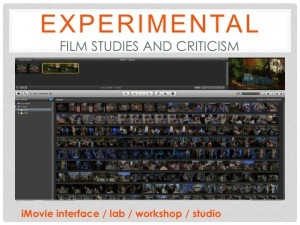 Author and editor of numerous film studies videos, as well as of written studies of intertextuality, film authorship and adaptation theories, she runs the Film Studies For Free, Filmanalytical and Audiovisualcy websites and, in 2012, guest edited the inaugural issue of online cinema journal Frames on digital forms of film studies. She is the founding editor of the REFRAME digital publishing platform, and is also founding co-editor (with Christian Keathley and Drew Morton) of [in]TRANSITION, a new videographic film and moving image studies journal. 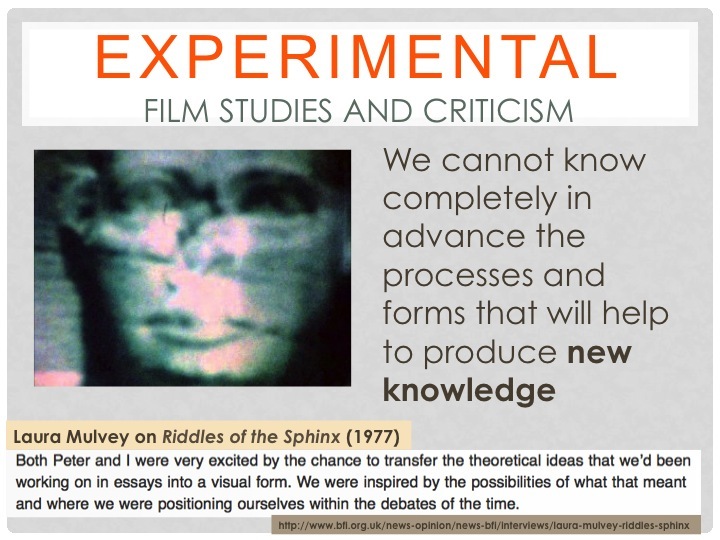 Her latest project is the website you are currently visiting on The Audiovisual Essay: Practice and Theory in Videographic Film and Moving Image Studies which she hopes will further encourage discussion and practice of this form. To download the audio file, right click this link and save.